We make large-scale textile art working with Scottish wool. The work is informed and influenced by the land we live on, by the sheep that graze the hill-farms, by the farmers who make a living rearing the sheep. Socio-economic factors play an important role. We collect Scottish wool direct from the farmers and can trace each fleece from the three principal farms we work with. The main breeds are Scottish Blackface from Colintraive, Jacob from Lephinmore, Hebridean from Inveraray. Scottish Blackface is of great interest because of its staple length. We are continuously exploring ways to strengthen the supply chain, encompassing heritage, history and the future, and to give new meaning, relevance and purpose to Scottish wool and our designs. The ‘making of’ of the products is highly authentic. We consider all facets of the process - including collecting the wool - as an integral part of the craft process. All the processing is done by hand: we collect, wash and treat fleeces at the studio. Hot water and heat required for the processes is provided by firewood, processed ourselves. The natural dyes are created from plants like heather, cowslip and Scottish thistle collected from the land surrounding the studio and further afield. We are creating a 'plant bank' of the vegetable materials available in this part of Scotland. Collaboration is a way of life, here on the West Coast of Scotland. We ’ve visited many inspiring people and organizations, such as Uist Wool with its scouring facilities and weavers of Harris Tweed on Harris and Lewis to investigate collaborating in the process. We design & create innovative large-scale textile products, from single pieces to modular installations. 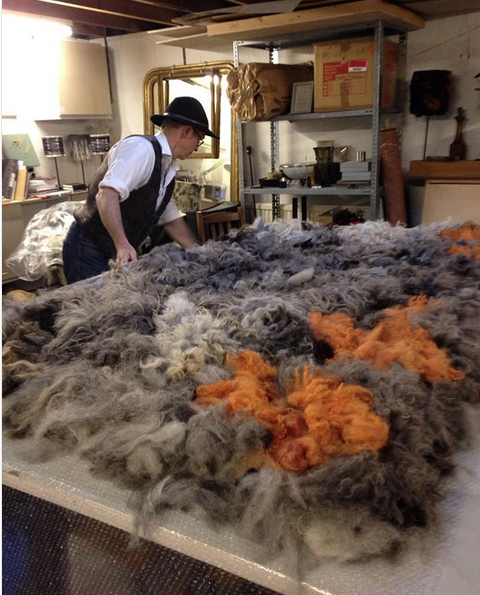 We use ancient felting techniques to create contemporary art and interior design products. We are able to work with our wool to offer lighting solutions. We work with individual clients, interior designers and galleries. We exhibit and offer creative workshops at the studio and in community settings (schools, community centers, care homes). We see an increased interest from clients looking for unique pieces with provenance, authenticity and credibility, and this we offer.